Bikaner city is an enigma for tourists with a fortified bastion built by the Rajputs spanning 7 kilometers with 5 colossus entryways. Built by the Rajput ruler Rao Bikaji in 1488 amidst the Thar Desert, Bikaner is a walled city with various sightseeing spots and neighboring tourist sites. Intriguing architectural delights in every nook and corner of the city with monuments, palaces, forts and museums; the city is a treasured paradise in the state of Rajasthan. Devi Kund Sagar is strongly recommended for tourists on a sightseeing tour of Bikaner situated at a distance of 8 kilometers. 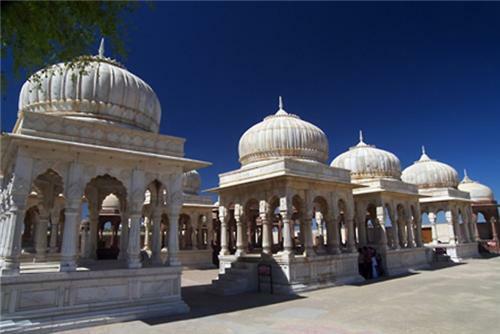 Devi Kund is the royal crematory built to immortalize the Rajput ruler Rao Bikaji, his descendants and other members of the royal family of Bikaner and the place is marvellous for housing several cenotaphs or monuments. Each cenotaph or monument has been erected in memorial of the deceased member of the royal family flanked by Chattris (decorated canopy) and a stela (a stone slab with carvings/engravings). Beginning with Rao Bikaji, his great grandson Jet Singh, Rao Kalyan Singh (1542-1571), Maharaja Anup Singh(1669-1698), Maharaja Gaj Singh (1745-1787), Maharaja Surat Singh and the last ruler of Bikaner, Maharaja Karni Singh ( 1950-1988). Most of the royal cenotaphs have inscriptions or epigraphs on the memorial stones along with marvellous architecture, engravings, floral patterns and designs along with beautiful portraits. A significant fact about the royal crematorium in Devi Kund is the distinct feature of the earlier cenotaphs made from Dulmera red sandstone and the later and recent ones from white marble. The art of paintings being made on cenotaphs commenced with Raja Ratan Singh’s monument or memorial and Maharaja Anup Singh’s cenotaph is a splendid artwork supported on 16 pillars and decorated with sculptures from life of Lord Krishna and bearing floral and animal patterns. The influence of both Mughal and Rajput architecture is visible in these royal cenotaphs. 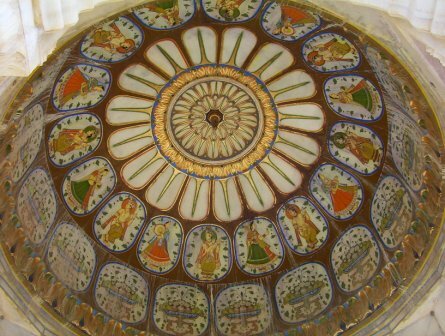 The royal cenotaphs for wives of the Rajput rulers cremated here bear a canopy and plaques with footprints and beautiful decorations and designs on the base while those for the male members of royal clan have white canopy with stela bearing their names and portraits. For children of the royal clan, the cenotaphs are white blocks but without a canopy. A remarkable feature of Devi Kund Sagar is that it houses the cenotaphs of 22 female Satis (self immolation) and 1 Sata (self immolation by man). The astounding cenotaph or Chattri of Maharaja Surat Singh of Bikaner is crafted out of white marble with exquisite Rajput paintings on the roof along with ornamental designs. The Chattris are flanked on two sides along a reservoir and is indeed one of the best examples of Rajputana architectural style. The sight is amazing and will be a bonus for tourists with an admiration for architecture. Do not miss out on Devi Kund Sagar on a trip to Bikaner!